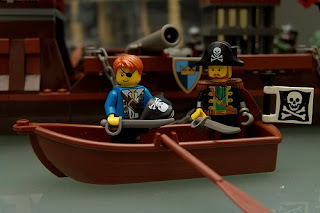 Thing 18: "They may pass for excellent men"
Zotero and Mendeley sound to me like the heroes or villians from a swashbuckling film. It's a shame that the truth is so much more prosaic; who wouldn't want a bit of swash on a Saturday afternoon? Reference management tools was possibly the topic I was looking forward to most in Cam23. Not only because I'm the sort of boring person who thinks that bibliographies are fun, but also because I've recently agreed to compile lists of recent publications of interest for a quarterly academic journal. This new responsibility has forced me to realise that now is probably the time to embrace technology and to reject lovingly hand-written references. Without Cam23 to spur me on, I'd probably still not have made the switch, so thanks you to the team. But nothing is simple, is it? I'm a make-do-and-mend sort of girl at heart, and my computing resources are a tad limited. No laptop. No smart phone. At home - one six-(and-a-bit-)year-old PC running Windows and Office 2000; one communal linux-running box that I don't much understand. Elsewhere - modern, fast PC at work, but no admin rights so ability to download and add-on somewhat hit and miss; my chap's moderately modern laptop; UL Digital Resources Area computers, which don't have Firefox, and on which customisation almost prohibitively restricted (no bookmarks toolbars, even, so far as I can see). database of references should be storable and accessible online, to allow for working from multiple machines. should work with windows and linux, IE and Firefox, and Very Old Word. must be able to export in MHRA style. should be able to deal with obscure journals and references, even if only by manual addition of citations. That's pretty much it. Can't be too hard, can it? Initial reading suggested that Mendeley had web storage options, and that Zotero didn't, but a very helpful Latinamericanist informed us over at Miss Crail's pad that Zotero can now do this too. So, to see what, if anything, was going to meet my needs, I've conducted an afternoon trial of both. 1. database storable and accessible online Yes, but 'Mendeley desktop' required to create citations (desktop can be synched with web). Yes, but citations generated from within Firefox plugin (library on individual machines can be synched with web). 2.1 windows and linux OK, so I've not tried either on linux: I might be brave, but I'm not stupid. 2.2 IE and Firefox Yes. 'Import to Mendeley' bookmarklet saves to bookmarks/favourites either menu or toolbar, 'in every browser'. No. Firefox add-on only. 2.3 Very Old Word No, plugin only compatabile with Word 2003 and 2007. There is option to copy a citation to the clipboard (and then paste it wherever you like), but I can't work out how to change the style of this citation. Help documentation only refers to changing style from within the Word pluigin. Not necessary. Can create bibliographies of multiple citations in any available style in RTF and other formats (including copied to clipboard) directly from browser. 3. MHRA style Technically, yes. Practically, not that I can figure out (see 2.3). Yes. 4. obscure references Smaller range of recognised websites than Zotero. Manual entry available online and on desktop . Larger range of recognised websites than Mendeley. Manual entry only possible from add-on, not online. It would seem that in an ideal world, Zotero would be the tool of choice for my particular need. The Firefox add-on was pretty painless to install, Zotero seems to extract information from more websites that Mendeley (so far as I could see), and it will actuall produce the bibliography I want on my own computer at home. But, I can't use it from the UL. This is a big sticking point (and I'll be emailing the UL shortly to find out why no Firefox in the DRA). It looks like I shall have to keep two accounts - Mendeley for the UL and anywhere else without Firefox, or where I can't install the Zotero add-on, and then Zotero at home for actually compliling bibliographies. Importing and exporting articles between Mendeley and Zotero in .ris format has worked well enough in my trails so far. This isn't an ideal solution, but might be better than writing all down (or cutting and pasting) by hand, if only for the auto-formatting. If you're reading this, and you know more about these tools than I do, and you've noticed any errors in what I've written, I'd really love to hear from you. I'm planning to go to Monday's drop in around lunchtime, or you can just post a comment below. On Wednesday afternoon, a group of seven-or-so members of staff from Cambridge University Medical Library came on a visit, led by yours truly, to see St John's College Library. This all came about after I met Isla, Reader Services Librarian at the Medical Library, at the CILIP future conversation held in Cambridge in June. She mentioned that she'd never been to St John's, I said I'd never been to the Medical Library, and a library visit swap was born. If you're interested in what we've got St John's, and what the visitors thought of it, then I highly recommend that you read Emma's, Anna's and Sheila's posts. It's certainly been very intersting for me to read their impressions of the visit. 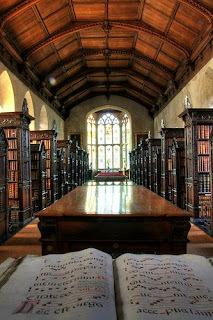 A library tour of this kind, in contrast to the tours I help to deliver to undergraduates in October, has no set goals. I'm not trying impress anything in particular upon the audience - whether that's borrowing limits, fine rates, the friendliness of library staff, the usefulness of Newton, or the range of online resources available (although some of these might still interest the librarian visitor!) - but rather just to show what's here, and, hopefully to invite comments and reactions that can inform the way I introduce people to the library in the future, and also inform what we actually do as a library service. It's something of an education to see which elements of the tour i must have been emphasising, and which stick with people enough to be repeated later. It's not something one usually gets to find out, and is one of the features of Web 2.0 that is often commented upon: beware, reviews are instant and everywhere! Anna's comment that I said little about e-resources was definitely fair. I'm not sure that I mentioned them at all, in fact! This stemmed from two things: 1) I little to do with user education or enquiries answering in my current role, and 2) I suppose that I didn't want to show up my own ignorance in front of a group which I imagine makes much greater use of e-resources than we do here. I shall definitely use the return visit to find out what the Medical Library is doing with e-stuff, and shall try in future not to let a fear of showing myself up stand in the way of a good learning opportunity. It's hard to argue with the general agreement that St John's is a beautiful library, although it isn't without its little idiosyncracies. It's lovely to hear other people say that, and although I haven't been working here for very long, I do feel proud when people are impressed. And it's good to be reminded, now and again, of what a remarkable building it is, and what a range of services we provide: on cold February (or even chilly July) afternoons it's all too easy just to curse the deficiencies in the heating and wish I was somewhere else. So, medical librarians, thanks for coming. It was a pleasure having you! My 'Day in the Life' posts so far have been all about specifics. Today I'll take the broader view and tell you a little about what a Hoyle Project Associate is, and why she does what she does. Sir Fred Hoyle (1915-2001) was an astrophysicist, science fiction writer, Munro-bagger, frequent correspondent with The Times, Plumian Professor of Astronomy and Experimental Philosophy, radio star, and controversialist. He invented the phrase 'Big Bang' although he didn't believe in the theory, wrote the soon-to-be-republished novel The Black Cloud (and much more including co-writing the BBC TV sci-fi series A for Andromeda), and suggested that life on earth might have been seeded from space. He was a Fellow of St John's College, Cambridge, and after his death, his family donated his collection of personal papers, books, and some artefacts to the existing special collections of the College Library, which include medieval manuscripts, early printed books, collections of personal papers and a range of artefacts. The Hoyle Collection is immense, the largest in the library, and covers all aspects of Hoyle's life and work. Any collection (be it books, papers, objects, images, webpages or anything else) is no good to anyone unless 1) someone knows what's in it, and 2) people can access it. These, to my mind, are the fundamental principals of librarianship: catalogue (i.e. work out what you've got) and make available (i.e. let people at it!). So the basic aim of the Hoyle Project is to catalogue the Hoyle Collection. 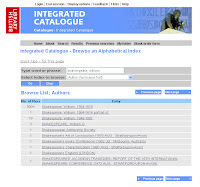 Eventually the catalogue will be made publically available on Janus (the Cambridge University archives catalogue), and through nationwide tools such as the Archives Hub and the National Register of Archives. In the mean time, there's a summary listing on the Library website. But cataloguing is just the start. 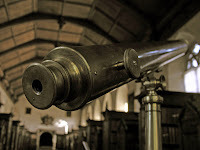 The Hoyle Project aims to make the Hoyle Collection, and the Library collections more widely, known to as many people as possible, and to increase knowledge of Hoyle, astronomy, the history of science, and the Library. and virtually and digitally via an online exhibition and hands-on build-your-own-astrolabe kit. My daily work is therefore a mixture of cataloguing, events planning, resource building, photography, web editing, exhibition curating, caption writing and enquiry answering. Thrown in is some everyday special collections work staffing the reading room where researchers consult books and papers, which involves fetching items from the shelves and storage areas, supervising researchers to make sure they treat everything with respect, answering queries about the collections, and providing information about reproduction rights. The work is definitely challenging, but also immensely rewarding. There's nothing like the thrill of bringing to science or history to life by using some of the wonderful documents and books that I'm lucky enough to work with. 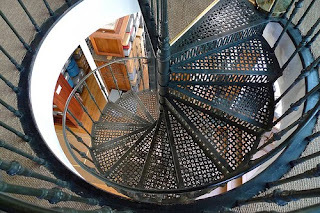 The Hoyle Project is funded by the Heritage Lottery Fund, St John's College, and the Friends of the Center for the History of Physics, American Institute of Physics. Want to help with publicity? Click here for more logos. TeachMeets are informal gatherings, or 'unconferences', which have thus far been organised and attended by teachers in various locations across the UK. The aim of a TeachMeet is to share ideas in an informal, productive way. Participants give 7 or 2 minute presentations in any format they like, with the emphasis on interaction between presenters and audience. Inspired by 23 Things Cambridge, a group of Cam23-ers* have decided to organise a TeachMeet for librarians. On the evening of 27 September 2010 (around 5pm-7pm) we'll be getting together at a venue to be arranged, with laptops, phones, pens and paper, and brains at the ready for a couple of hours of discussions and new ideas. Anyone with a library connection is welcome, university or no, Cam23-er or no. You can present about anything that fits into the topic "techie tools and teching tips" - it needn't be one of the Things, or a high-tech Web 2.0 doo-dah. So long as you think it's interesting then you'll be very welcome. 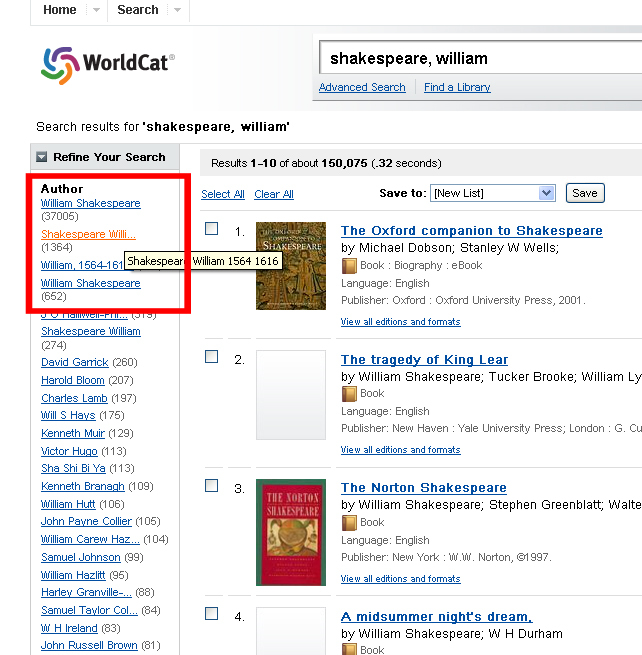 ...Have you got a library widget, gadget or tool that's been a roaring success and you want the world to know? Are you trying out something new and looking for input as you develop it? Did you try something that went horribly wrong, and want to save us the same agonies? If you think you can express your new library initiative through the medium of interpretive dance (or something a little more prosaic), or you'd just like to watch someone try, we'd love to hear from you. Comment on this blog post (or one of the others), tweet with the hastag #camlibtm, or sign yourself up (as participant or observer) on the wiki (still a work in progress). Lots of library-related news in the UK in the last 24 hours, as the Department for Culture Media and Sport announced a 'Review of arm's length bodies' including proposals to abolish the Museums Libraries and Archive Council, the UK Film Council, the Advisory Council on Libraries and the Legal Deposit Advisory Panel. I would have liked to have made more time today to read all abaht it, but alas it was not so. I look forward to seeing more from CILIP on the matter in the coming weeks. Today a girls' choir from Greenwich, Connecticut, were visiting the College as part of a day in Cambridge on their tour of England, and I took them up to our Old Library. Visitors rarely fail to be impressed by the building and its 400-year old oak bookcases, and our largest book, a late fifteenth-century Spanish antiphoner (chant book) was of particular relevance to this group. Groups of visitors can be shown the Old Library by prior arrangement with the Special Collections Librarian, and we have on average a few every month, both youngsters and adults. In addition to pre-arranged group visits, members of College ('members' includes both current students and alumni) may bring guests to the Old Library at any time during our working hours, and two separate such parties arrived today within 10 minutes of each other. I catalogued some more of the papers from yesterday's box. I created some icons for use on blogs and websites to link to LISNPN, the L(ibrary and) I(formation) (Science) New Professionals Network, and added one to my sidebar to link to my LISNPN profile. This evening I'm going to a meeting to discuss the possibility of organising TeachMeet for Cambridge librarians, and I intend to blog about that separately. I chased up contacts regarding a possible book republication event. Do hope they get back to me - it's a great opportunity for publicity (and book sales) for all involved. Received confirmation that some mp3s of Hoyle giving lectures in Montreal can be used by the Fred Hoyle website maintained by his family. At morning coffee, my colleagues and I enjoyed tucking into some Fitzbillies Chelsea buns kindly given to the Library by a reader. Prepare for a visit of medical librarians tomorrow afternoon - I'm really looking forward to hearing what they think of our library, and to my return visit to the Medical Library at some point over the summer. Think about what I need to do next with the paperwork for Chartership. Just writing 'sort out chartership notes' yesterday wasn't specific enough to get me to do anything useful today. This my first post as part of the fifth round of Library Day in the Life a project started by Bobbi L. Newman, Librarian by Day. I only heard about Library Day in the Life on Sunday, so I've not followed any of the previous rounds and this is something of a leap in the dark. I ought really to start with a post explaining my rather cryptic job title ('Hoyle Project Associate') and my place of work (St John's College Library, Cambridge, UK), but I'm going to leap right in with Monday, and will try and fill in the gaps later and/or as I go along. I work in the Library's Rare Books Reading Room, a place for readers to consult, under supervision, items from the Library's special collections. Today saw two phone calls and one email arranging three separate reader visits to see one medieval and two post-medieval manuscripts. We also had two readers in the room, one looking at a post-med manuscript, and one using the photocopier. Most photocopier users outside of other Library staff require some assistance with the machine, and interpreting its repertoire of cryptic error beeps, at some point or other. Reminding attendees of an informal meeting tomorrow evening to discuss organising TeachMeet in Cambridge. I'm currently undertaking the CILIP Chartership process, and am also participating in the 23 Things Cambridge programme. Today I read through the Thing 18 post about Zotero. Noticing that Zotero is a browser-based tool, and looking for something web-based that I can use from home, work, the UL, and all points north, I had a quick look round the Mendeley site, noted the Mendeley Web feature, and that it supports MHRA-style citation. The bulk of my workload is cataloguing Fred Hoyle's personal papers. Today I started a new box (the papers have all been transferred from the filing cabinets they arrived in into archival-quality boxes) which demonstrates the flexibility of the term 'papers' in this context. These pictures show not only a folder of papers removed from the books in Hoyles' library (also held at St John's and catalogued on Newton as the Hoyle Collection), but also a film reel of Stonehenge, volumes 2 to 5 of a children's encyclopaedia of science (articles within which include 'Phosphorescence' and 'The earthworm'), and a number of issues of the Monthly notices of the Royal Astronomical Society. The other main strand of my work is outreach to schools, special interest groups and the general public. Forthcoming events include participation in Open Cambridge and the University of Cambridge Festival of Ideas. Much of this morning was spent designing a flyer to advertise our Festival of Ideas event (an exhibition of literary manuscripts and free expert talk from College fellows). Thing 17: "This whole earth may be bored"
There's a certain air of apathy permeating the crop of Thing 17 posts, and this has definitely affected how I've approached it. I can't remember anyone being enthusiastic enough about Linkedin that I thought it would be worthwhile to sign up for an account, and this post is therefore only a brief discussion of a few other Cam23 posts, and has no pretensions to in-depth analysis. I read one of the further reading articles (the other has repeatedly returned a network timeout error), which made a fairly convincing case for being active on Linkedin if you're a business man, headhunter or entrepreneur. Now, while I'd love to be head-hunted for a top-notch special collections outreach post in one of the world's top libraries, I'd be surprised if they were looking for me on Linkedin. Unlike Andy Priestner, I just don't have enough enthusiasm to maintain my sticker collection just in case I'm wrong on this point. The consensus seems to be that there aren't enough library types on Linkedin to make it a worthwhile networking resource. The Cam23 post says a much, as does Emma on her Thingymeblog. Magistra et mater has undertaken a small-scale experiment to compare take-up between Facebook, Linkedin and Academia.edu and concludes that "none of the sites really predominated, and none convinced me that I had to be on them. [...] Given how much it involves maintaining a presence on one of these sites, I think libraries are going to have to think quite hard about which services to sign up to." It's not that I don't think that online networks are useful, but they're only any good if there are sufficient active people with a similar interest. One up-and-coming network to watch (or join) might be the LIS New Professionals Network. With about 230 members at the time of typing, it has a resources area, jobs RSS feed, and forums for discussions of LIS courses, chartership, and all manner of other things. It's only been recently launched, and there's a certain buzz about it at the moment. Hopefully this will continue in the coming months, as this seems like a much better way of keeping in touch with colleagues. Thing 16: "To follow me and praise my eyes and face?" My relationship with Facebook isn't love/hate so much as mild indifference/hate. I've had an account for 5 years now (I signed up right after finishing my finals), but I honestly can't say that it has in any way changed my life. I normally only log in when I receive an email notification of some activity involving me (a message, or an event invitation), but I've kept my account because several of my old school friends seem to use it as their primary means of communication. My profile is definitely a social and not professional one. Not that I post the details of my weekend (tea and knitting) benders, but it's more light-hearted than I would perhaps desire for a professional presence. Several other Cam23 bloggers have noted the difficulty of keeping the personal and the professional separate on Facebook. The system of 'friends' is monolithic - there's no option to have some people as 'colleagues' and others as 'bosom pals', as is discussed (at some length) in this week's number one Cam23 slideshow (brought to my attention by Ange Fitzpatrick). Do note that this presentation was produced by Google, who, we are told, feel threatened by Facebook's increasing online dominance. Having had a look at the various Cambridge libraries Facebook pages, I can see that they could be useful in communicating with users. A Facebook presence provides another means by which the library can be contacted. But this is only of benefit if queries are answered quickly. A library page on Facebook showing unanswered questions on its 'wall' will be worse for impressions of the library than not having the page at all. Once again, these social media tools seem to be good only if there are sufficient resources available to moniter and maintain them. While I have no real criticisms about the library pages I visited, none of them (either specific or general) grabbed me enough to 'like' them or to join them. This is partly because I'm not much of a joiner, but also, I think, because of the way Facebook looks and works. Everything looks the same all over Facebook, whether it's the homepage, a personal profile page, a group, a fan page or an app page. Andy Priestner has described this as 'ridiculously restrictive architecture', and limits on what can be done have been noted by others. I tend to feel that the Facebook page (even with its status updates) doesn't offer enough above a library webpage that I want to stick my colours to its mast. I might not like LibraryThing for a range of what I consider to be good, librarianly, search-and-organisation based reasons, but it isn't 'alf addictive. And useful - the different default collections, including 'wishlist' and 'read but unowned' neatly solve two problems: I don't really like keeping a wishlist on Amazon (I have pinko-liberal lentil-knitting views about what Amazon has done to local bookshops) and I like to keep a record of what I've read in libraries but am bad at doing so on paper (the notebook is never nearby when I want it). This new-found addiction is also driven in no small part by seeing what recommendations will appear when the collection is broader - at the moment a lot of suggested works are just further books in series that I already part own. So without really meaning too, I'm up to 70-ish books now, and just by thinking about what I've got lying around at home. A methodical assault on the shelves might lead to the purchase of a life account. Not a lot to do with work in libraries, and a big ol' drain on my time. Oops. Edited to add: I've just found the 'Local' tab, and it turns out that there's already an entry for the library in which I work. We've got some events coming up (as part of Open Cambridge), so I've added those. Every little publicity helps. Thing 15: "What dreadful dole is here!" So, the end of my last post saw me confused and infuriated by a LibraryThing that didn't really live up to my expectations. But whispersinthewilderness has reassured me that I can get full book information when I have an account, and in compliance with the 23 Things instructions I've signed myself up. 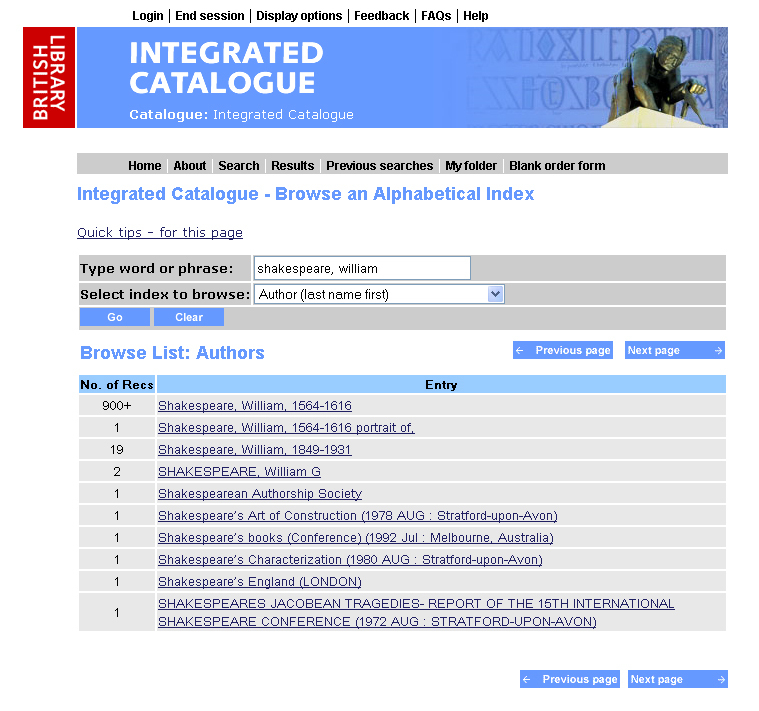 Adding books (even after photographing my most difficult bookshelf and cataloguing it remotely without dates or ISBNs) is easy enough, although I'd still like to be able to limit searches and filter results by date. Some of the more obscure things I own were found successfully, even my most favourite book ever, a German translation of a Mexican novel that I bought for a few Marks from a stand outside a corner bookshop in a suburb of Bonn one rainy November lunchtime in 2001 (oh, happy days!). I did have to search a number of German library catalogues to find it, and it turns out that I'm the only LibraryThinger to have it, so I hope everyone's impressed with my recheché tastes! Weirdly, it's not possible to add a book to your own library from its page in LibraryThing - when you click on the 'add to my library' link you have to choose a databse to search for it. But for obscure things, it's hard to know which database to choose, and for ephemera it can be necessary to add the details from scratch. So adding it can take ages, even when other people have already clearly got it. I don't really understand why a new entry can't just be linked to what's already there. So some of my collection of comic strip pamphlets haven't made it on because I'm too lazy. This is a shame - it's for the really obscure things that I think it would be most fun to connect with other readers. Overall, I can see that there's a lot of good in LibraryThing, for libraries and librarians, library users and book lovers. But I'm not sure that it and I can overcome our rocky start together. Thing 14: "I understand not what you mean by this"
it's large enough to generate useful user-generated tags and reviews (in contrast to most OPACs it exceeds the necessary critical mass of participants. 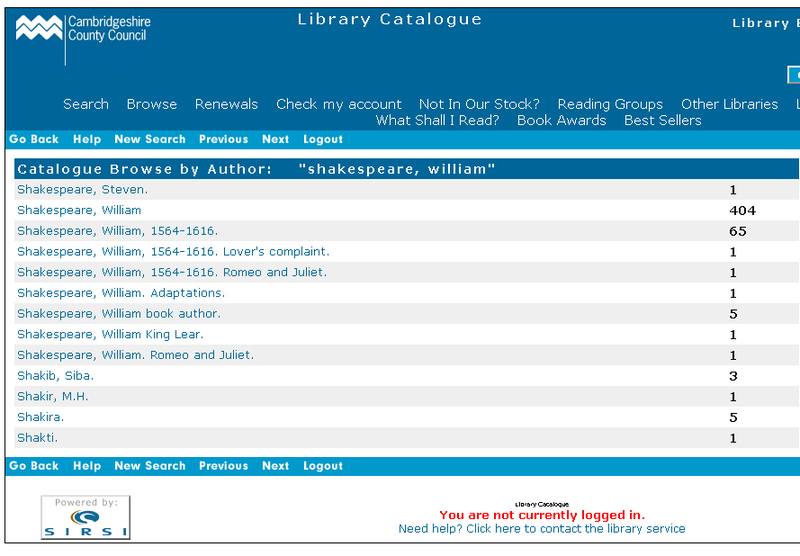 It will be interesting to see if new BL OPAC will exceed this threshold or not). The two articles set as Cam23 reading (although now several years old) made interesting arguments in favour of it as a personal and library tool, and were echoed (though in less detail) by a recent CILIP Gazette article (link to online Gazette Flash version). Looking at the two example libraries, I can sort of see the use. As see Magistra notes, the CSL Library page seems to have been abandoned a couple of years ago, and is maybe a lesson it keeping things updated or getting rid of them altogether. But the Nuffield College list of new accessions look useful - there's lots of information on the profile page about what's on LibraryThing, why, and about the library more generally - though it would be interesting to know if they're also used. I've not chased up any of the libraries mentioned in the Gazette article for integrating LibraryThing tags directly into their OPACs, but that certainly sounds good in principal. 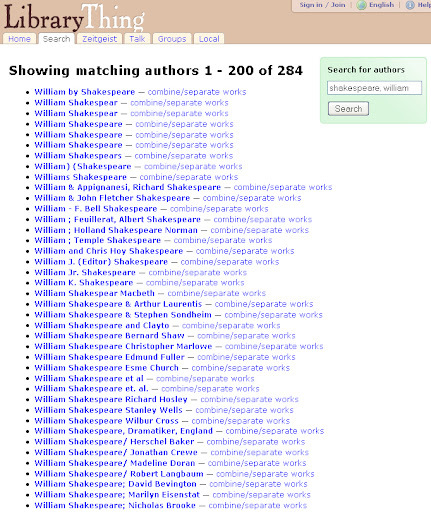 I tried searching for "William Shakespeare" and this is what I got (click to magnify). 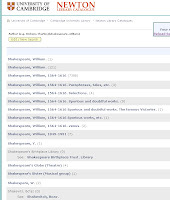 Yes, that's a large, undifferentiated list of names, one of which is "William Shakespeare", and the rest of which are typos, name headings with bonus added extra titles, and a few valid occurrences of Shakespeare in combination with other information. 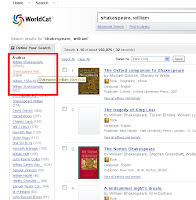 I want to find out what there is from and about Shakespeare - how do I know where to click? There's no indication of how many hits there are for each result, and it looks like I may have to check them separately to find what I'm looking for. No thanks. So, I've discovered that I can find my favourite author, even if the denizens of LibraryThing have been misspelling his or her name with wild abandon. But what about looking for one of his books? I try another search, this time for Fred Hoyle's The Black Cloud (vintage sci-fi aficiandos please note - to be re-published this September). And, lo! I find a work-level (or is that expression-level? I haven't mastered FRBR yet) description page, with tags and reviews and popularity ratings, and further assorted bells and whistles. All very nice. But I'd like to know more about this book, so I click on details. Here I find out it's LC and Dewey classification numbers, subject headings and get a recap of user ratings etc. But I'm not satisfied - I'd like to know when this book was published, and by whom. Indeed, I see that it's been translated, too - can I find out more about those translations, or about the various English editions I know to have been printed? Well... kinda. The editions page tells me that there have been more editions than I can be bothered to count from the screen, and that some of them were in languages that clearly aren't English, and that many of these have ISBNs. It also tells me how many of each copy is held by LibraryThingers. But I still haven't found a single piece of publication information about this book. Am I missing something? Is there really no place, publisher or date of publication included? I note that there's no option to order search results by date, nor any date box on the search page. Am I the only bibliophile who's interested in publication information? If I'm not, why is it so hard to uncover from LibraryThing? Or is it something I can only find out once I've signed up? If so, not letting me know it'll be there isn't encouraging me to join. I've considered not publishing this post because I must be making some really obvious mistake (I tried searching the help wiki too, to no avail), but, well, I trust Cam23ers to be kind in enlightening me. 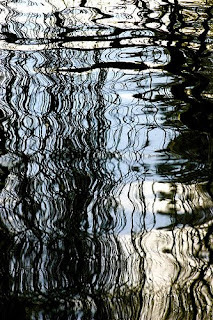 Thing 13: "Her silver visage in the watery glass"
Celine has already said so much of what I've been thinking about while reflecting, that it's hard to know what to write here without just repeating her points. 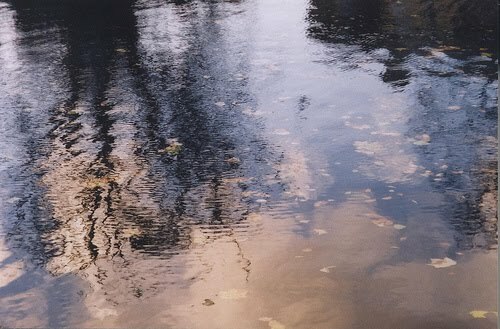 And the first repeated thing: I have a habit of trying to read everyone else's posts and then finding that everything good has been said, several things I disagree with have also been said, and my post has to grow to enormous lengths to cover everything I wish to comment upon (or, it has to fall short of what I'd really like to say). An obvious solution to this is to post before I read, but when my opinion's going to be public I like it to be considered, and the other cam23 posts are giving so much food for consideration. I shall try to be more selective when thinking about future posts. It's difficult to write a full evaluation and not so useful for other cam23-ers - I'm most interested by the posts that respond to particular points about or features of each Thing. At the start of 23 Things I wrote: "I hope to learn lots of practical skills, but also to have a much better idea about which gadgets are best for what." I've definitely learnt how to do new things, including embedding widgets into websites and combining RSS feeds, and I've seen what a number of tools I'd not used before actually do. But more thatn learning which gadget does what, I've been thinking about the ways in which different sites are increasingly linked together (and being frustrated when some of them won't easily), and what this might mean for library service provision in The Future (I haven't worked it out yet). So cam23 has helped me think critically about what skills I might need in the future as a professional, and what in which ways users might reasonably expect library services to be integrated into other online activites. As for confidence, I was fairly confident that I would be able to figure out how to use the Things in the course, but I wouldn't have necessarily tried these new things without some reason greater than curiosity. So having a structure that encourages (I was going to say 'forces', but that's unfair) me to look at something each week has been really beneficial (I agree with Aidan on Blutmetry about the value of the look-try-think-comment structure of the programme). Once I've made the first step into trying something out I'll keep tinkering away with it without further encouragement, so I don't need instructions any more detailed than those given. The nature of the instructions - some written, some screenshots, some video tutorials - has made me think about the ways in which instruction can be given. I'll try in the future to think more carefully about which tool is best, and not to reject videos and other embedded widgets just for being flashy and modern! Equally, the cam23 posts have shown the value of a simple list of things to do - it's a question of picking the right tool for the job. Trying out the different Things has certainly increased my confidence to comment and contribute instead of being a passive absorber of content. I've really enjoyed diving in and taking part instead of sitting on the sidelines watching things fly past my nose. I've signed up to the LIS New Professionals Network, and talked to @theREALwikiman about difficulties with editing my profile there. I've looked at some documents put on line by Tony Hirst (@psychemedia) and talked to someone who had commented on them. I now feel much more connected and involved with what's going on in the world of libraries (and aren't we cursed with living in interesting library times?). Discussion of Web 2.0, social media and the future of libraries at recent Libraries@Cambridge conferences (why isn't this link findable by navigating from the Libraries@Cambridge homepage, especially as the slideshows are now available? Am I missing it somewhere?) left me wanting to bury my head in the sand, but now I've dared to get involved with some of the Things, I find that I'm actually quite interested in some of the issues that were being discussed. Watching what other people are talking about makes me feel more confident to make my own judgements about what's good, bad, or indifferent, and about where things might be headed. Having gained this confidence, I'll continue to try to write some of these thoughts down and maybe engender a little discussion of my own. This increase in communication has applied as well within the real world of Cambridge, and not just online. There is no shortage of communication means in Cambridge libraries (as discussed last month on Blurtmetry), but I'd previously felt a little 'out of the loop'. Now I feel like I've got much more idea what's going on, and have even met up with some people face-to-face (with more of that to come in the future!). This speaks, I think, to the value of the immediacy of many social media. If someone writes a blog post, or tweets something, then the default assumption is that they're open to, and maybe hoping for, quick comments from other people. With traditional forms of communication, if someone sends, say, an email bulletin it seems less appropriate to reply with something simple like 'yes, I found that too', or 'have you tried this...', so connections between people are less frequently made. Or maybe I just feel less shy with the my cam23 guide to hide behind. What else have I learnt? Over the last few weeks it has become unavoidably clear (though, in truth, I knew it already) that I am an inveterate tinkerer. Nothing is safe when I'm around - it will be fiddled with until I have it just so (and not just computery things, either, you should feel sorry for the things I knit, and unravel, and knit, and unravel, and knit...). This means that I need to set myself time limits and constraints when working on any kind of project, otherwise the time spent will balloon as I 'just test out one more feature' or 'try it laid out the other way round'. This applies as much to blog layouts as setting up exhibitions, writing reports, or even cataloguing papers. It has been useful to have this trait made so plain to see, so I can more consciously try to curb it when necessary in the future. There's has been no Thing that I could see no point in at all, so I will bear them all in mind for particular scenarios and recommend them to others as they seem appropriate. Scary though it might be to look into the future, I'd also recommend keeping an eye on early-adopters and 'web guru' types like Tony Hirst and Phil Bradley to see what they're talking about. There's no need to try everything out right away, perhaps, but it's useful to keep an ear to the ground as to what might be coming round the corner. Personally, setting up an RSS feed reader (Google as it happens, but I hear others are good, too) has been the biggest gain. Now the internet comes to me (and isn't there a lot of it!) 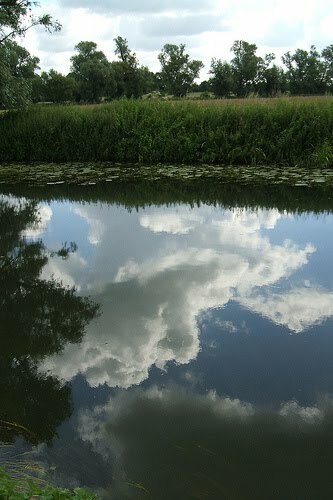 and I spend much less time cycling through my favourite sites to see if there's anything new. What I would like to change about my approach for the rest of the Things is to pay more attention to the further reading suggestions. I often find myself wanting to know more, and wondering where to look for it, when there's a perfectly good link or three waiting to be clicked on the cam23 page. Truth be told, I'm sometimes just a bit lazy to read what I'm told to. I've started as I mean to go on with this goal, and have revised this post in light of what I've learnt from reading B.A. Sen's article. One last thing... On the day that Thing 13 was posted (aeons ago in Web 2.0 time), this blog post of resources for librarian bloggers was posted by thewikiman. It's based on a presentation at the CILIP CDG New Professionals Conference 2010 and is well worth a look! Inspired by Isla's post about TeachMeet some Cam23-ers are going to meet up to have a think about organising something TeachMeet-y for Cambridge librarians. If you're interested please say: you can sign up to the Doodle poll of meeting times, comment on Isla's post, tweet, email, or in some other way indicate your willingness to get involved! P.S. There have been murmurs of having glasses of something to help get the creative (and planning) juices flowing! Thing 12: "Yet mark'd I where the bolt of Cupid fell"
It's a mystery to me why I haven't set up a Delicious account sooner, given that I can utterly see the point of it. While there are some links I only really use at work, and some I only use at home - which can therefore be cheerfully be bookmarked in the browser on home and work computers - there are some that I don't use everyday, that I won't remember without prompting, and that I might want to access from anywhere. Foremost in this list would be 'articles I saw somewhere-or-other but didn't have time to read immediately'. With these all neatly stored away in Delicious under 'toreadandinwardlydigest' they'll be available to me whenever and wherever I have a chance to read them. Very handy. I also like the design of the site - clean, clear and simple. I like the ability to organise tags into bundles, the choice between viewing them as a list or as a cloud, and between them sorted aplhabetically or by frequency of use. The tools are handy, too, although I'm not sure I'll go all the way and embed a tag cloud or bookmark-roll on my own blog. What do you think? I can definitely see the merit of using Delicious in a library or other information-management environment. To my mind, it's a great way of disseminating links and resources. Because it's a dynamic tool, users can pick out the links they're interested in by using and combining tags, rather than having to read all through a list put together by someone else: there should be a higher wheat-to-chaff ratio for each individual user than on a static page. From a librarian's perspective, it's also probably easier to maintain than a page of links written in a CMS or in straight html. One disadvantage of using Delicious is, however, that you will be referring users to an outside site if they want the full functionality of the service rather than just a 'latest links' widget embedded somewhere else. This means that they might not realise that the service is being provided and managed by the Library. I haven't really investigated the 'community' aspect of Delicious yet, so I can't comment of the usefulness of being able to search other people's tags. As with so much, I expect that the value is dependent on the like-mindedness or otherwise of you and the other however-many-millions. It's probably fun to search, but I'd be surprised if it was an efficient search tool. One final thought: where do I bookmark the Delicious homepage? P.S. Magistra et Mater's thoughtful post on Delicious comes highly recommended if you're looking for another opinion. Thing 11: "I am aweary of this moon"
I somehow don't like how it looks, and I'm not sure why. The advanced search could be easier to find, and I'd like to be able to search for users via their user names but also by searching their user information. Something has made the BBC live radio player hang a couple of times, and I suspect it might be Slideshare, so it's not very popular with me right now. But it certainly fills a niche, and I can't see any glaring problems with the way it delivers slides. It's worth noting that writing a slideshow for independent use is different to writing it to be talked to in real time, so some of the show work better than others. What particular benefits to your Library are there from using Slideshare? I think having induction/information presentations online for readers to use could be useful - it's one more way of reaching people, and it's often easier to explain how to use a service in bit-sized picture heavy formats than in a wall of text. Screen recording tools (like those discussed by Phil Bradley here) also seem useful for this. Did you find any interesting presentations that you would like to share? This isn't the prettiest presentation ever (and a couple of words drop off the bottom of the screen), but it's a good basic introduction and works well without the original speaker . 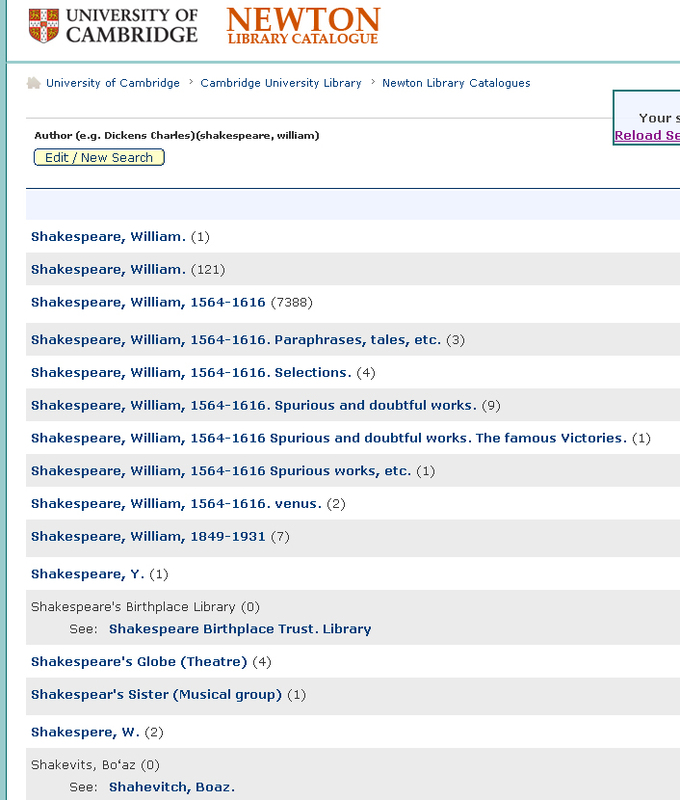 Did you find any other users from a Cambridge University or College library? No, but I didn't look very hard (Bad Girl! No biscuit!). Will you use Slideshare in the future? Yes, I'll certainly use Slideshare or something similar in the future to make available presentations that I give in the Library, at conferences, for public events etc. Yesterday, the last day of the CILIP conversation, I posted some thoughts about the online version of Update, CILIP's monthly professional magazine. This morning I received an email from Elspeth Hyams, editor of Update, asking if I would consider posting the following text, and I am happy to do so. It is always good to receive comment on Update's content and the delivery channels we are using to deliver it to members. We introduced a digital edition to complement the hard-copy magazine in October 2008. It was a first step. This year we have added web-only issues with video and audio content (impossible in print). We’ve also built up a two-year digital archive. And we are publishing more frequently, despite having to cut our costs significantly. Update's digital edition enables us to keep publishing despite the recession. The web-only issues significantly reduce our print and distribution costs. You personally may prefer a digital issue, but many of our readers do not. They say they already spend so much of their time at computer screens. That is why we have introduced the option for members and subscribers to download a PDF copy. Those who prefer can read the magazine at their leisure. Update's turn-the-page digital offering is a format publishers worldwide are using. It offers the opportunity to develop apps that allow download to iPhones, iPads and other mobile devices, so we are in good company. Of course, cost efficiency is a key driver for CILIP at present, and developing database-driven online information services is frighteningly expensive. The Guardian website, for example, may be a dream to use but it has cost a fortune. CILIP just does not have the resources to match this type of service, but it is using one of the UK's leading developers for its digital offerings and they are being enhanced all the time. Just look at the difference between the new web-only digital issues (lots of links to facilitate navigation, video and audio content) and the archive copies (a simple facsimile of the original print edition). We have a strong and dedicated readership for the hard copy magazine and are building up a significant readership for our new web-only issues too, which have been well received, and praised by some members. They especially appreciate the quality content we provide. Where we can, we have taken their views into account and made many changes to the initial offering. It is not perfect, but every issue is better than the last. Taking into account the options available, and our current cost constraints, we believe we are on the right track. We do hope that if you read the content, you will find it of increasing value to you - whatever the delivery platform. By the way, who are you? Shouldn't you have the courage of your convictions and identify yourself? We do! I'm keeping myself anonymous on this blog for the time being as I'm new to blogging (those coming in fresh from elsewhere might not know that I've taken this up as part of Cam23) and I'd rather make my mistakes without my name all over them for the time being. If you would like to know who I am, you can always email me at maedchenimmond at gmail dot com.